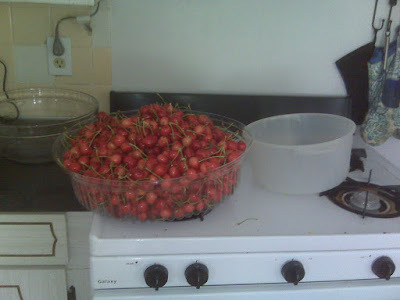 robataka's blog: Did I Mention Cherries? Did I mention the cherries from our tree are ready? 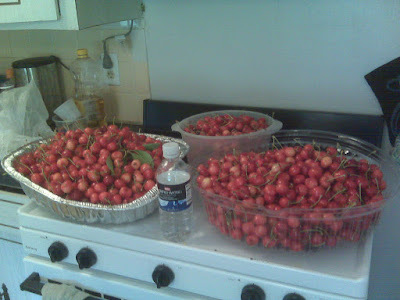 Oh, right, this morning I posted about picking cherries. Yesterday, Elly, Ken, George and I were out for about an hour maybe less. 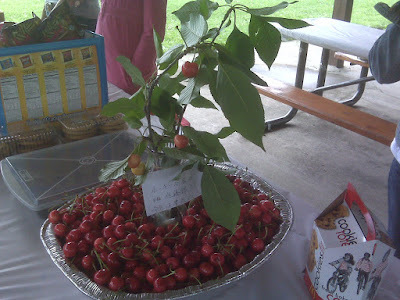 As I mentioned in this mornings post, the cherries we harvested yesterday were way more than we could eat so we were taking them to the JANO Sakura Picnic. Of course, as I mentioned in this mornings post we only began to touch the cherries on the tree. Suffice it to say that we yanked them back out, after giving a ziplock bag full of cherries to the mother of Ken's soccer teammate who was over to collect money for some soccer games this summer. This time, in place of Elly, we had Arisa. And let me tell you, we got some real work done with mom around. For the next 90 minutes we teased cherries out of the tree. And wouldn't you know, we got even more than yesterday! At least double the amount of cherries if not more. 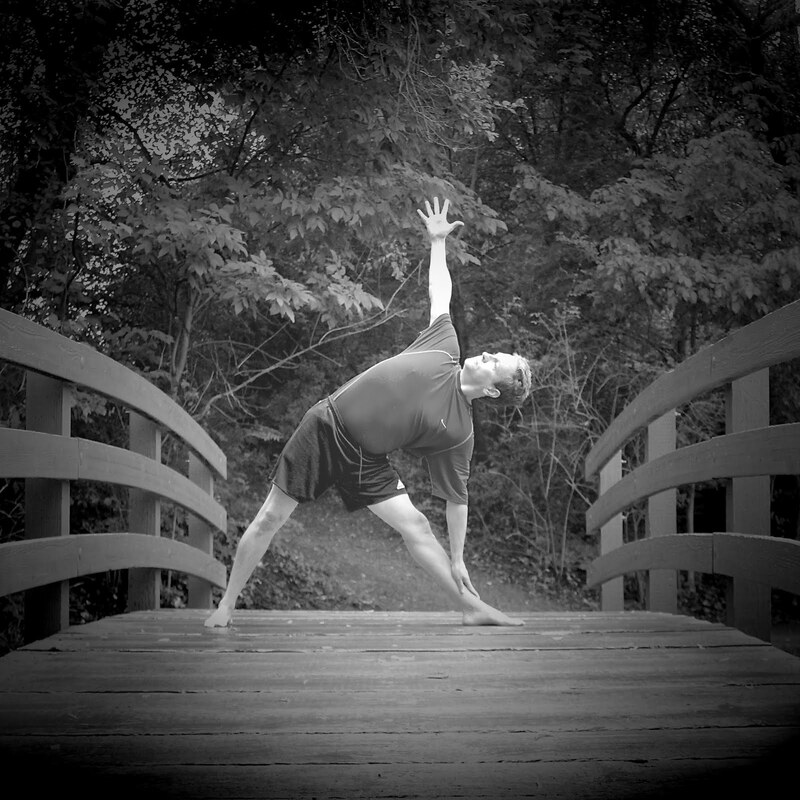 This is the picture from yesterday. So check out the picture below of today's haul. Note that the container on the right is the same container from the picture above it. It's a little less full than yesterday's version, but check out the two extra containers we had to use! The next picture is for some perspective. I added a water bottle so you can get a sense of the size if you couldn't before. There still a whole bunch of cherries left on the tree, but we can't reach them. So the birds get lucky and get a feast of cherries. Not that they feast on them. They leave like more than half after eating some which is really annoying. Didn't there mother tell them to finish everything on their plate? 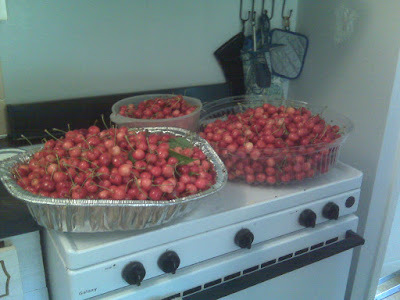 So the big question is, what are we going to do with all these cherries? Anyone got any ideas? Please suggest some since we really can't eat all of these.